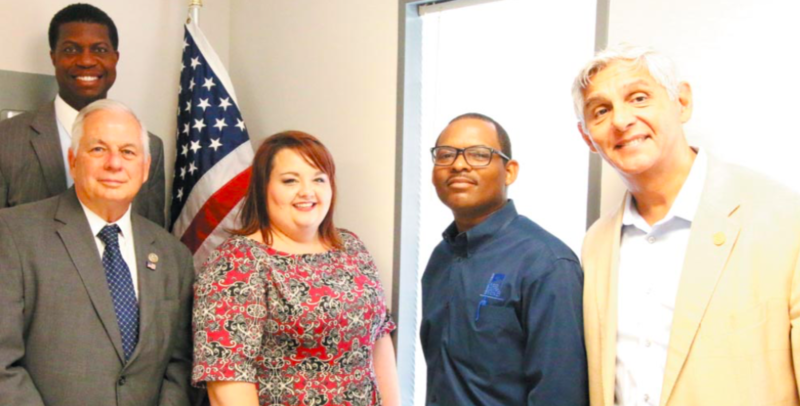 L – R: JP Judge Joe Stephens, Congressman Gene Green, Harris County’s Emergency Operations Center Manager Misty Gunn, Harris County Flood Control Precinct 2 Coordinator Jeremy Ratcliff and Houston City Councilman District I Robert Gallegos. Houston, TX. – Monday, June 11, 2018 — Congressman Gene Green brought governmental agency representatives together to give the preparedness advice to citizens since we’re now in the hurricane season from June 1 through November 30th. Misty Gunn, Harris County’s Emergency Operations Center Manager said, this is the time citizens should make an Emergency Essentials Kit. The contents needed for the kit can be located at, WWW.READYHARRIS.ORG. 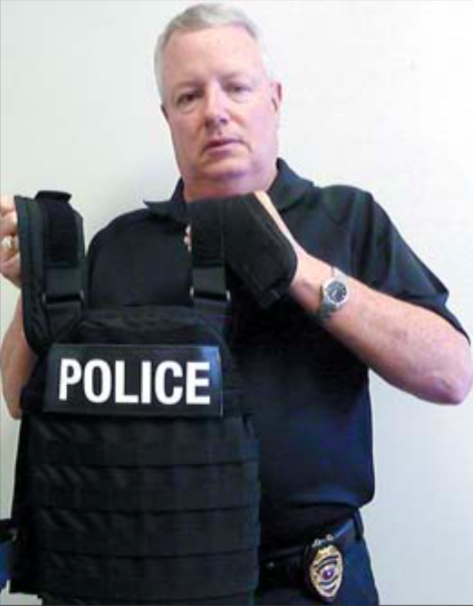 “In addition to your kits contents, if you’re evacuating from high water, put inside a water proof container or plastic bag your prescription drugs, a printed list of all relatives, doctors and insurance agents phone numbers, cell phone and cell phone charger, credit cards and checkbook, important family documents (birth certificates, insurance/ bank account information, etc. ),” Guinn said. Harris County Flood Control Precinct 2 Coordinator Jeremy Ratcliff, and Communications Officers Robert Lazaro, said Commissioners Court plans to call a bond election for August 25, 2018, for the Harris County Flood Control District. 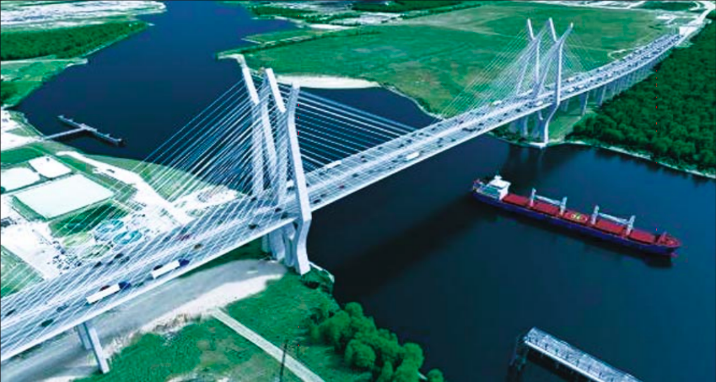 Voters will be asked to vote on what could be $2.5 billion in bonds for flood risk reduction projects throughout the county. To learn more about the flood bonds visit, WWW.HCFCD.ORG/ BOND-PROGRAM. L to R: Police Commissioner Rodney Chersky, retired Police Captain Ken Ponder and Mayor Esmeralda Moya. Detective Tim D’Antonio received his retirement badge but was unable to be present for the photo. Galena Park, TX. 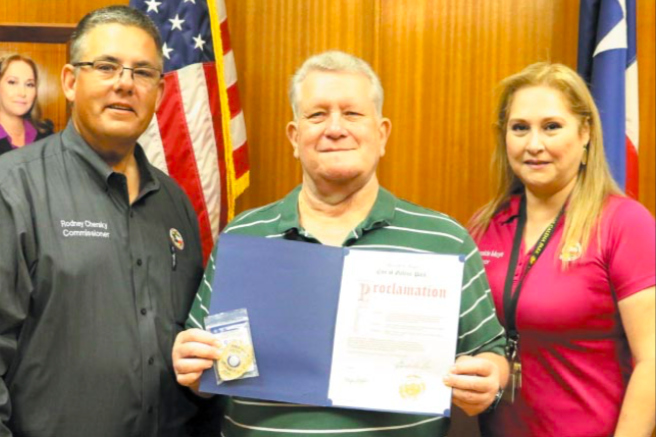 – Friday, June 15, 2018 — Mayor Esmeralda Moya and Police Commissioner Rodney Chersky presented 26 year retired Police Captain Ken Ponder a gold retirement badge and a proclamation signed by the mayor commending him for his honorable service to the city. Chersky said before his and Moya’s time in office, the city failed to present retiring Captain Ken Ponder and Detective Tim D’Antonio their retirement badges. 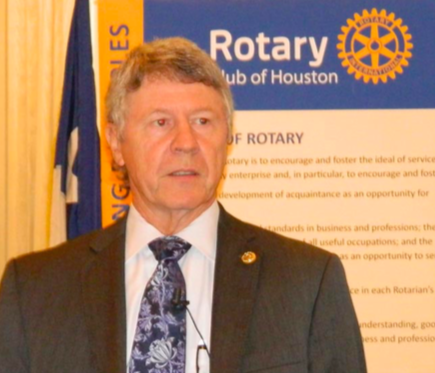 Judge Ed Emmett speaking at the Rotary Club of Houston last week. 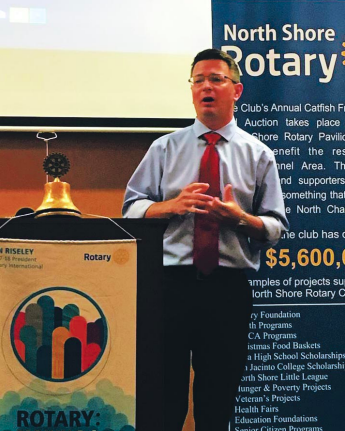 HOUSTON – In a wide ranging talk before the Rotary Club of Houston, Harris County Judge Ed Emmett spoke about a number of topics of interest. He started by talking about his appreciation for the work that Rotary does in the community, and across the world. He gave examples from his own experience of how he has been touched by and involved in this work. Then he spoke about the upcoming $2.5 billion bond issue that will be on the ballot in a special election on August 25th. He explained that the date is the one year anniversary of the devastation when Hurricane Harvey hit the Texas coast, causing flooding throughout Harris County and other parts of the state. “Harvey changed a lot of lives,” he said. He noted that 154,000 homes in Harris County and Houston flooded. The Hurricane dropped 51” of rain in a four day period. Many homes were destroyed or made unlivable, and there were many deaths in the flood waters. 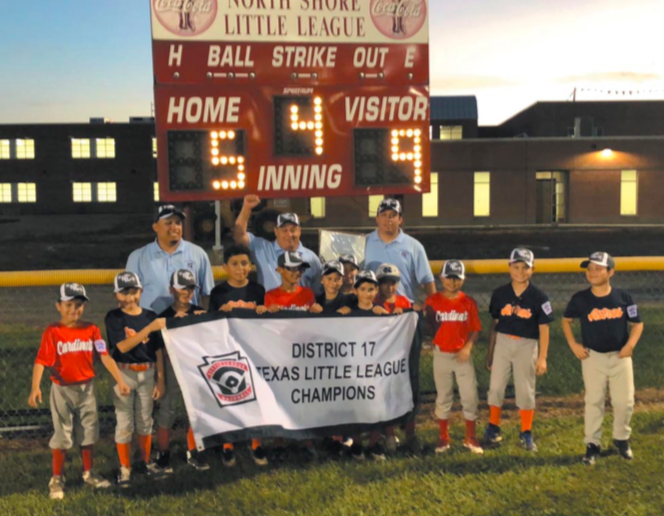 The North Channel Little League 9 Year Old Live Arm team went undefeated to take the District 17 All Star Tournament. Players: from bottom left to right Daniel Correa, Kevin Guerra, Daniel Olivas, Ivan Espino, Juan Sias, Josue Rebollar, Adrian Olivas, Ethan Bonilla, Damian Correa, Athan Castillo, Fabian Beltran and Alex Rodriguez. Coaches: from top left to right Robert Rodriguez, David Rodriguez and Roland Rodriguez. Galena Park, TX. — June 12, 2018 — The City of Galena Park has hired their 3rd Chief of Police in two years. Hiring a 30 year Galena Park police veteran, Sergeant James Michael Knox was sworn in Friday, June 8th. After serving only 4 months, retired 30 year Houston Police Officer Richard “Rick” Gonzales was asked to resign. Gonzales said, “In February I got a call from former Sheriff Adrian Garcia who asked me for my resume. When I asked him what for, he replied, ‘The mayor of Galena Park is looking for a Police Chief and I need your resume immediately.’ Mayor Esmeralda Moya called me on February 22, 2018 and asked me to come to city hall the next day so she could swear me in as Interim Chief. “I wasted no time meeting citizens, school administrators, heads of different departments, and business owners. 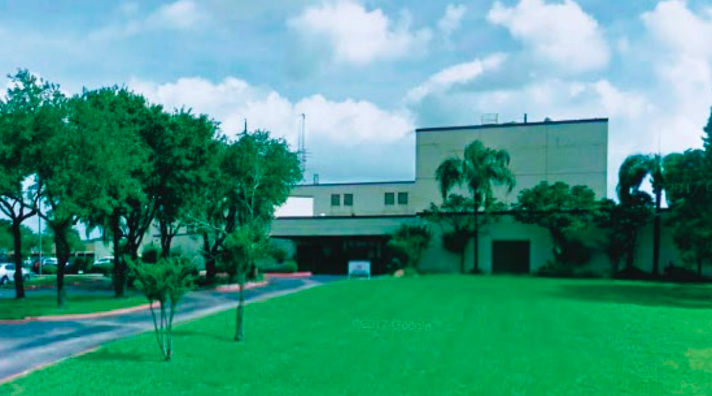 The mayor said she was receiving good responses from the citizens regarding my presence in the community, and asked me to be the Chief as long as she was Mayor,” Gonzales said. “I was under the impression I was to reduce crime and enhance the quality of life in the neighborhoods, I was doing that until the Mayor said for me to stop. I found the community tremendously divided, and my addressing issues of the community are not what the Mayor seems to want,” Gonzales said. Gonzales posted his resignation letter on his Facebook page. New Interim Chief James Michael Knox is 57 years old. This will be his third time to serve as Interim Chief, having previously served as Interim Chief under Mayors James Havard and Bobby Barrett. 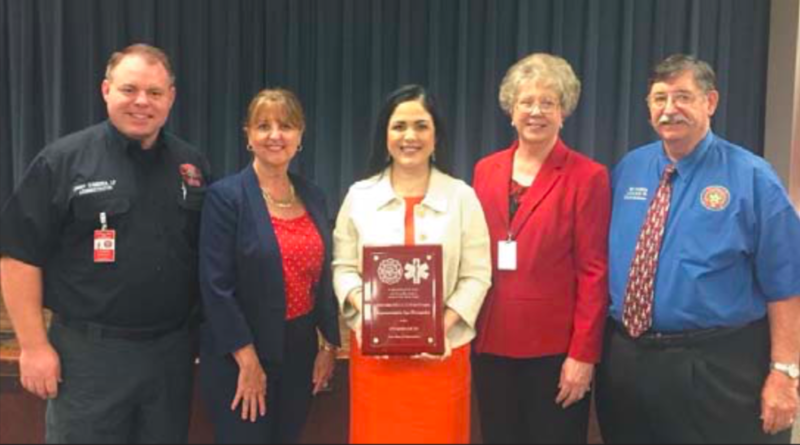 East Harris County Emergency Service recognized Rep. Ana Hernandez as Legislator of the Year during the North Channel Area Chamber of Commerce June Luncheon. “I was incredibly humbled to have been honored as Legislator of the Year by the East Harris County emergency service districts while recognizing first responders,” Rep. Hernandez said. San Jacinto Pilot Club new officers with District Governor-Elect Gail Wilson, left. Next to her, new president Julie Fallin, Karen Westbrooks, Carolyn Roberts, and Joan Van Fleet. Wednesday, June 6, 2018, the San Jacinto Pilot Club installed their new officers for the 2018-2019 Pilot year. Pilot International’s Texas District Governor-Elect Gail Wilson was the installing officer for the evening’s banquet, held at the home of Jerry and Julie Fallin. Guests enjoyed a steak dinner while watching the sun set on Burnet Bay overlooking the historic San Jacinto Monument. 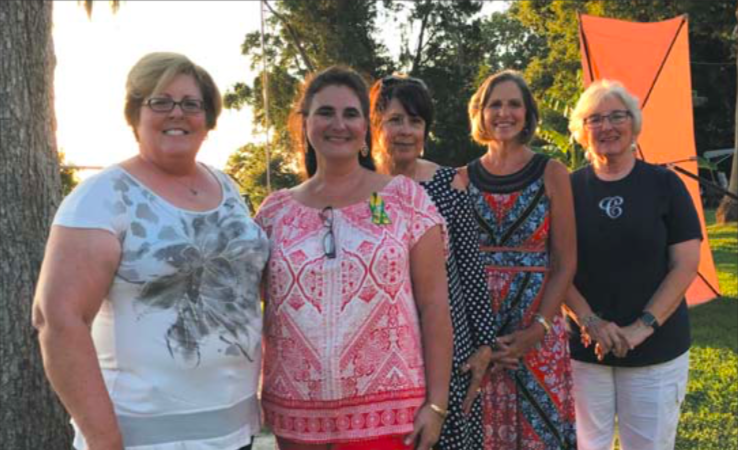 Officers for the 2018-2019 year, which begins July 1 are: Julie Fallin, President; Joan Van Fleet and Carolyn Roberts, Co-Secretary; and Karen Westbrooks, Treasurer. We wish all these officers the very best of luck this Pilot year. 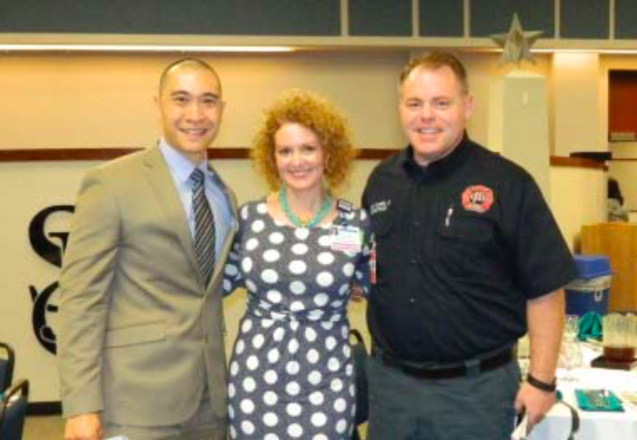 Dr. ALAN LO and CEO JEANNA BAMBURG of the Bayshore Medical Center, with JIMMIE SUMBERA of Channelview Fire Department. First Responders were honored, and thanked for their service, at a North Channel Chamber luncheon last Friday, June 1st. Mike Williams gave an emotional talk about his experiences with First Responders, and then William Anders, commissioner of ESD12, made presentation to each First Responder that was present. First Responders are firemen, EMT personnel, constable, sheriff’s deputies, and policemen. Representatives from most of the local departments were present to receive a certificate of appreciation. Also honored was State Representative Ana Hernandez, recognized as “Legislator of the Year” by the Emergency Services District.